The May SACC newsletter is here! Click the link (<) or click on the "Newsletters" tab at the top to view current and past newsletters. Did you know? : You can find a wealth of information in the tabs at the top of the page, including SACC bylaws (About), who the current board is and how you can apply to be on the board (Meet the SACC), contact information for government agents/agencies/services (Important #'s), and a whole lot more!! Don't forget to check out "The 'Burg in the News" for news articles that mention Schnitzelburg and Germantown. We just added a Courier Journal article on the Old Hickory expansion. Yes, you read that correctly! 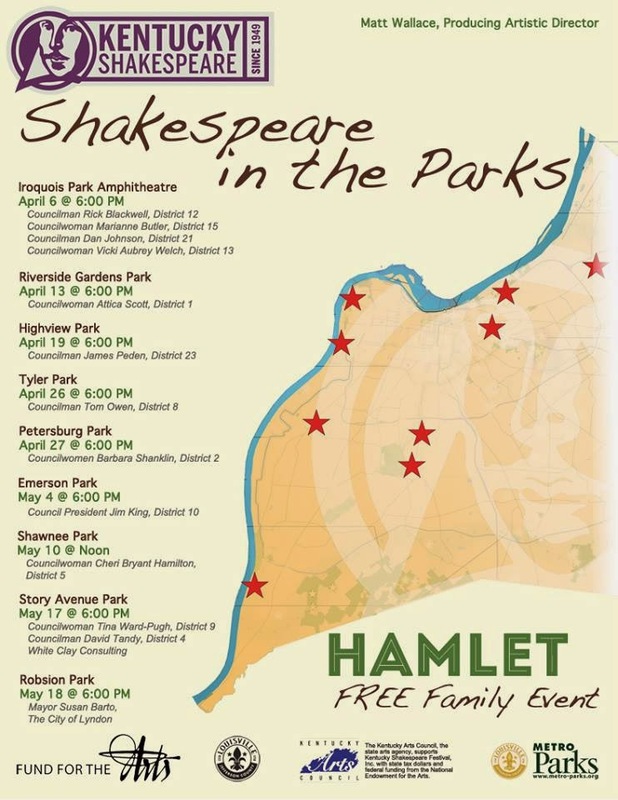 Kentucky Shakespeare is touring local parks around Louisville and bringing Hamlet to Schnitzelburg's Emerson Park on Sunday, May 4th at 6 pm. This is a free, 90 minute version of the Bard's famous tragedy of treachery and revenge performed by a cast of 8 actors. "This is an exciting piece of the transformation of Kentucky Shakespeare," said Matt Wallace, artistic director of Kentucky Shakespeare, in a news release. " we are dedicated to bringing free, accessible, professional theater to our community, and we are thrilled to branch out to new neighborhoods. This touring production of Hamlet is the kick-off to our upcoming summer-long festival for the city of Louisville." Kentucky Shakespeare, a non-profit charitable organization and professional theater company, has held the oldest free Shakespeare festival in the United States for fifty-three years, offering Shakespeare in Central Park in Old Louisville during the summers. Matt Wallace became the executive director of the organization last summer and one of his priorities has been to emphasize free outdoor productions that would allow as many patrons as possible to enjoy the Shakespeare experience. That meant bringing Shakespeare outside of the Old Louisville neighborhood. 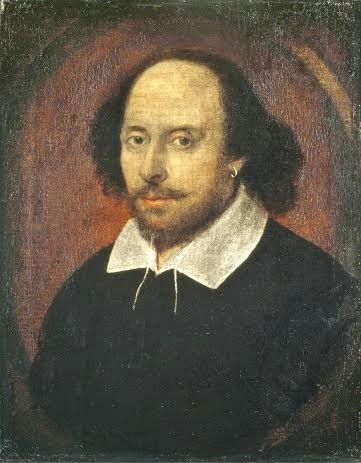 It was decided that the 2014 season would be expanded into the spring with "Shakespeare in the Parks," with performances taking place in various parks throughout the Louisville area. Schnitzelburg was one of the lucky neighborhoods to have Hamlet visiting. Kentucky Shakespeare will be back at their newly renovated home stage in Central Park, where three main stage productions (A Midsummer Night's Dream, Henry V, and the full production of Hamlet) will play June 11 through August 17. Visit their website for more information. Watching a Shakespeare play live is by far the best way to experience the Bard's famous works. Ye owe it to thyself to make it to Emerson Park on Sunday or to Central Park this summer! There will be a limited number of picnic tables, so bring your lawn chairs and blankets to the park to celebrate William Shakespeare's 450th birthday! Restroom facilities will be made available at the park for the performance. The SACC will also have a tent set up with free and for purchase refreshments. Stop by and say "hello!" A special thanks to District 10 Councilman Jim King for generously sponsoring this event!